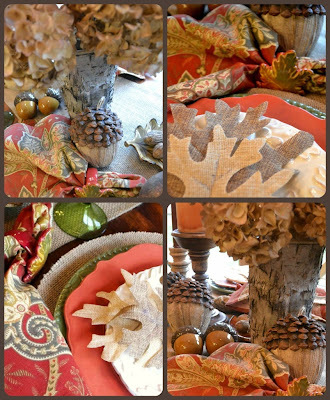 As the leaves are just about down and all the acorns are on the ground, I have set a table to bid goodbye to the beautiful days of fall. From here on out our fall is turning to colder days and bare trees leading into the next season. My sister contributed the dried hydrangeas for the centerpiece, seeing as how my hydrangea just quit blooming a couple of years ago and I still haven't figured out what it's problem is! 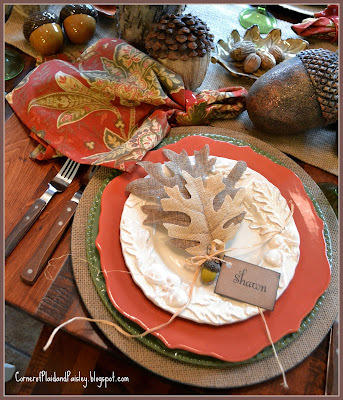 I love these burlap leaves I found, they were actually on a big branch - but I pulled a few of the leaves off to adorn my place settings. I just love all the colors of fall and really don't look forward to the grey, cold weather ahead. Just after I took these photos, our first real snow started falling! I used to not mind the winter when my boys were playing hockey - it kind of made the winter around here bearable. Now that they are all grown up and we are no longer as involved in the hockey scene, winter is not as fun. Although I am one of those weird people who loves a good snow storm!! 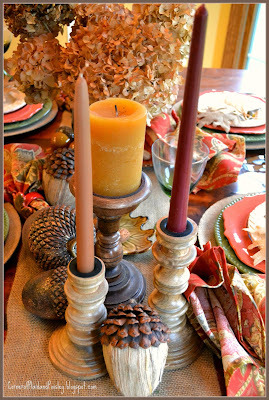 So farewell to fall as we start to prepare for Thanksgiving and the colder weather ahead. Hi, Ann! I'm not very happy to see winter coming, either. Our temps plummeted from highs in the 70s one day to highs in the upper 20s the next. What the what?!??!?!??!??! We were devastated! It's WAY too early for this kind of frigid weather! We're not used to getting this until January. We're piling on the clothes and the blankets and having to crank up the furnace like it's New Year's Eve!!! And as for snow...it's pretty to look at, but it just wreaks so much havoc that I have a hard time loving it!!! The burlap leaves are g-o-r-g-e-o-u-s!!! I love novelty stuff like that! I had to enlarge the photo to get a really good look at them, and they are n-i-c-e!!! 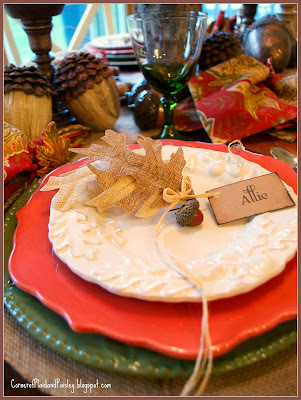 They make a great embellishment for your place settings. 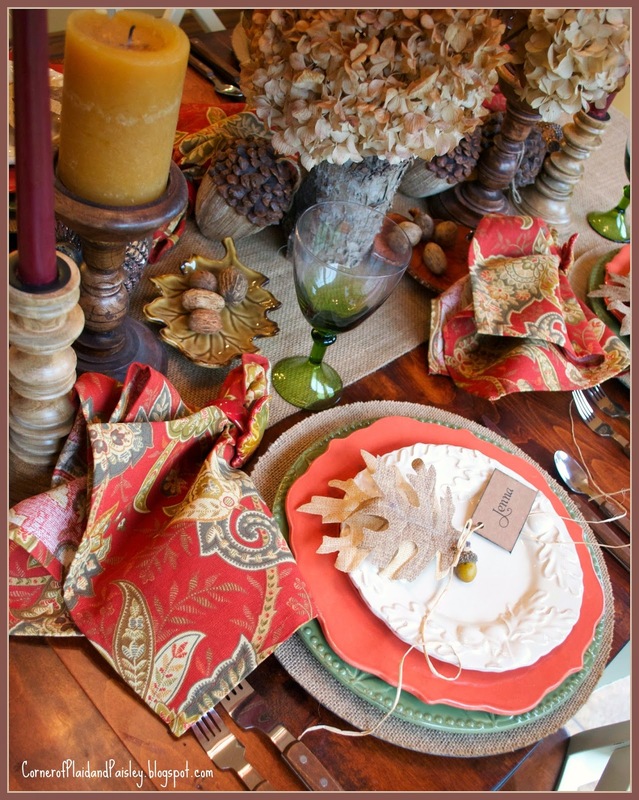 Gorgeous, richly colored napkins, too! I really like the flourished design. 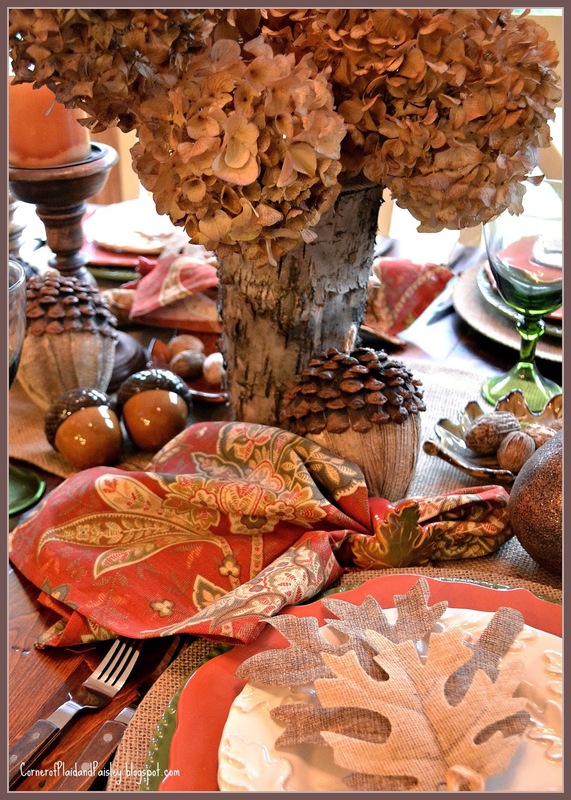 Your centerpiece is rockin', and good thing for your sister to the rescue with the hydrangea! Sorry to hear yours are acting persnickety. I hear they get that way sometimes. I planted one a few years ago to see how it would work out. The doggone thing was dead as a doornail by fall! Have a great weekend, take care if you're out in that snow, and just in case I don't get a chance to say it later....HAPPY THANKSGIVING!!! Love the details, especially those burlap leaves. Happy Thanksgiving to you! Beautiful tavble, Ann!!! As for your hydrangeas; do you cut them back in the fall? Hydrangeas only bloom on old wood. Love everything about this table, the leaves, acorns and pretty stck of dishes! It plummeted from 70 on Wed. to 30's last night and we got some snow:(:( I am NOT ready for snow but AM doing my Christmas decorating. I was wondering if since I was pulling all my snowmen out, Mother nature decided to give me some:):) Have a happy and blessed Thanksgiving and I hope you will be surrounded by family!!!! 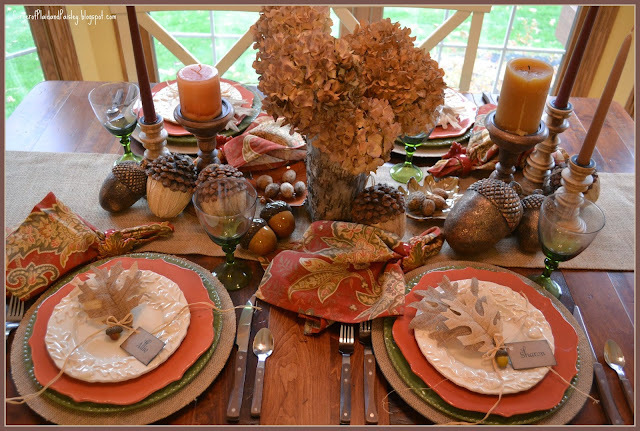 Gorgeous warm, inviting fall table, Ann! Love all the different acorns...I couldn't find any real ones in my neighborhood so I had my sister send me a box of them from Vermont! Love your place cards...or should I say place leaves. Great mix of color and elements. The leaf place card arrangements are cute! I hear you on the snow and winter subject. We have snow on the ground already and it's too early for my liking. Since we have a white landscape outside for so long it's one reason I crave color!